Got to be a joke! He's not going to sign a contract if we make him wear that! I didn't like it at first (thought it was too boring) but looking at that picture I think it looks really good. Think the white version someone posted here doesn't look good at all. Love the new Jersey!! Can't wait to get one. I’m sure we haven’t had a home shirt before without the proper crest colours. Obviously we’ve done it with away shirts but it would seem wrong not to have the proper badge on a home shirt. Don’t think it’ll happen. Don’t feck with a home shirt crest. The shorts are going to be black aren't they? I'm going to cry. Not really them 90’s kits look ugly as Fcu£ now. Can you imagine us wearing a kit design like the 97kit or the 93 with the laces. This in red would be the best United shirt since 2006/07. White shorts look so much better. Why would the shorts be black? This year was the only year we did that, our standard look is red shirt, white shorts and black socks. There's literally white shorts in the picture. Prefer the black crest to the white mock up someone did on the last page. Dark crest on a slightly darker red = classy. Love it. The short is also cool. Hmm, yeah, idk but I feel white color suits us better. Feels like it's just right. How United should be. So something like this + design of the twitter pic + the white short. Then we can just have our usually cool away kit black color again. Yeah I hope to never see black shorts as part of our home kit. I just spotted black on the shirt /crest and felt that may be the case. Glad it's not. I actually like that better than the home kit. Yeah, it's far too similar to this, even down to the stupid orange badge and logo. Having that colour on our kits that one time made no sense, and now it's inexplicably back. Hard to understand Adidas's rationale with these decisions. It's decent and tidy but nothing inspired. It's not orange it's "electric red" to symbolise our glory nights in Europe under the floodlights or at least that was the PR guff in 2016. Kits are looking good IMO. I can't remember a decent red kit since Ronaldo was here in 2009. The split red colour was decent in the Zlatan season too actually but other than that, the away or 3rd kits have always been better. I thought it was a light red/pink colour not orange. 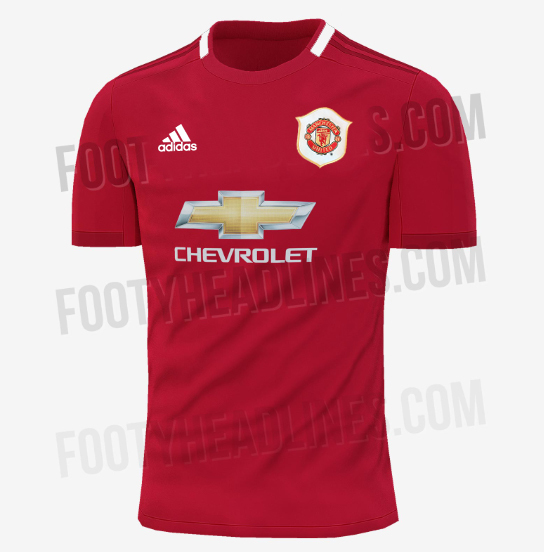 It's a shame about the colour of the Chevrolet logo, it kind of ruins the shirt by being so dominant. Not much we can do about it as they are paying an absolute fortune for the privilege. I would love to see us back with Sharp but I may as well ask for Charlize Theron's phone number. I feel every kit should have the proper full colour badge. Especially the red home kit. They've fecked around with the away kits without full colour badges and now they've done the sacrilegious thing of removing it on the home shirt. Just awful. I can understand for training tops to have a one colour badge or grey outline. Don't feck around with the home kit please. Yeah, they weren't fooling me then with that marketing guff and they won't fool me now either. I don't know why but I laughed reading this. I really can't get over how bad our Adidas kits have been when I was expecting them to be awesome. Removing the colour from the badge should never happen - not least on the home kit. Probably cheaper to make in one colour. It certainly makes it look cheaper that's for sure. Maybe she go completely the other way and have the badge in many different colours - anything other than the drained and dull efforts we are getting at the minute. It looked rubbish the first time Umbro did it 20 years ago on our second and third kits the summer after the treble - it still looks awful. The leaked home kit looks beautiful. Still apprehensive about a beige away kit but the black away one looks pretty nice. Although its hard to balls up a black jersey in fairness. I quite like the new design..
Our home jersey looks fantastic. Will buy the authentic version once it’s released. Wasn't it due to LVG and his backroom staff which was our 'Dutch era'? That was a theory, but never an official line. Presumably people will say that this time it is to celebrate his retirement? edit: Actually jumped the gun too quickly here, seems to be fanmade. I do love the design though, and would be pretty cool if the chevy logo was in the same black/gold design as the logo.